The one below combined hand dyed silk with various fibers, and I removed the glass bowl after the vessel was dry. I have ideas for more of these, and may even try making some with silk fibers, instead of the silk fabric. 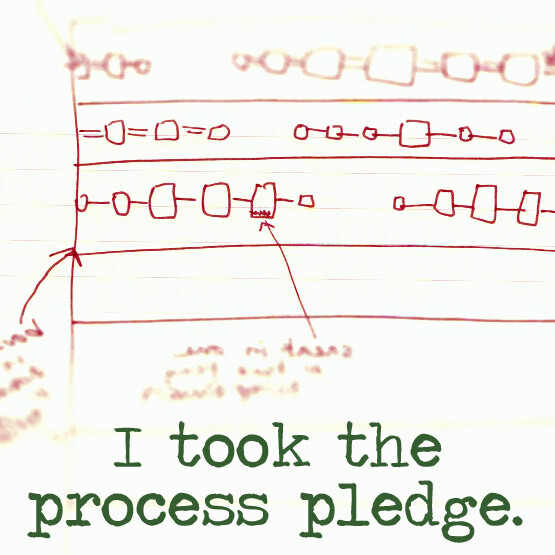 On another note, I recently saw a video by Liz Kettle, artist, on 15 minute stitch meditations and it caught my fancy. The idea is to just stitch, with no outcome in mind, to just relax and enjoy the process. I have done a few 4" x 4" squares so far, using scraps of fabric and various threads... I love making these! I have wanted to get back into doing hand work for quite awhile, and just never seemed to be able to transition into it... kind of like a block. Now I have a daily exercise to get me to put needle to thread and play, and it's helping me find my voice again, stitch-wise! On the gallery front, sales have been brisk this month... the hot pads and mug rugs have all sold, most of my Pine Cone ornaments are gone and several bowls are going to new homes, along with some shirts & tops. I have 2 more shifts at the gallery for the year, then the slow-down period will be here and I plan to bring my stitch meditation squares with me to while away the hours in the next month or so. Happy Holidays to all, and hope you find time to feed your creative muse during the winter days ahead! Nothing new there, but I have had lots to do this past month, and I feel like I'm breaking new ground for me again! Of course, there's been the push to make items for the gallery... holiday shoppers have been making the rounds ever since Black Friday, and items are being scooped up, leaving gaps in my inventory to fill. It's pretty small, only about 3 1/2" high by 5" wide, but it is a good start, I think. Again, I found a great tutorial by a gal at Living Felt: https://www.youtube.com/watch?v=fm6qmoxSgis&t=906s. It's actually a 2-part video, well worth the view for anyone wanting to learn how to make these. And that's been what has been keeping me busy this past month! 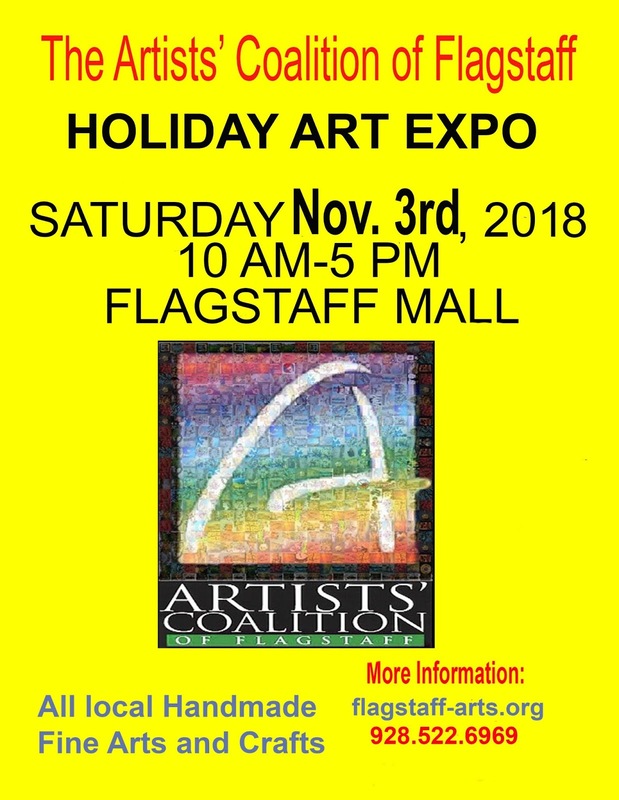 If you are in the Flagstaff area, I hope you will stop by the Arts Connection Gallery at Flagstaff Mall and make us your "go to" place for holiday shopping! If you are out of the area and interested in my work, please contact me via e-mail (see my profile). This has been a busy month for me! I am working to build up my inventory for Holiday shopping. I also taught my first Lids, Handles and Embellishments bowl class on the 13th. I had 5 lovely gals in class, and they took off running with these new techniques! 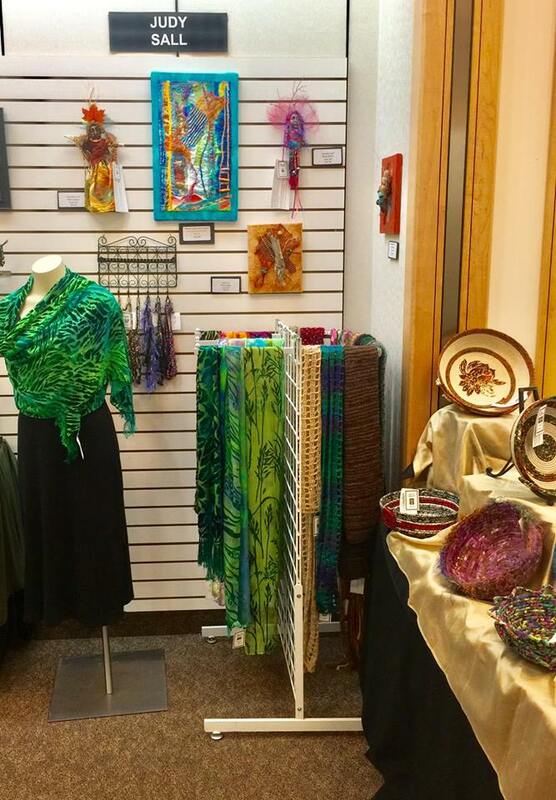 And I have continued to add items to my Artfire Store, for those who are not in the Flagstaff Area. I stayed home and thoroughly enjoyed watching it come down... love the changing seasons! So with just a couple of weeks until the Holiday Expo show November 3, I'm busy working on what I will bring to sell. 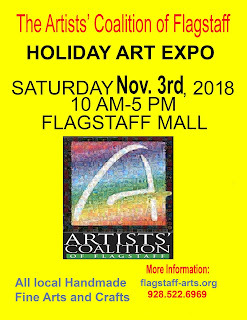 The show will be at the Flagstaff Mall from 10:00 am to 5:00 pm, and there will be a number of Artists' Coalition of Flagstaff Artists there to show and sell their work. If you are in the area, I hope you will stop by! I actually made up a number of leaves before making the bowl and lid above, so I have lots left over for other projects! Now I'm looking at ideas on pinterest for other ways to use autumn leaves in my work... obsessed? Maybe! But they have been a strong influence on my work for many years now, and will probably continue to crop up in my art. Can't beat Nature for inspiration! I was so pleased that all of the students seemed to have a fun, productive day, and hope they will continue creating more bowls. My next class - Lids, Handles & Embellishments - is scheduled for next month, open only to students who have taken my basic bowl class, and there are at least 2 from this class who plan to sign up. I will post pictures of that class afterword. Happy bowl-making, ladies! By the end of the show, I was pretty worn out, what with breaking down, then bringing my wares back into the gallery the next day to set up. But all that effort was worth it, and I'm looking forward to brisk sales in the coming months leading up to the holidays. Meanwhile, I decided it was time to re-open my online shop on Artfire - see the tab above. I have pulled my Easy Breezy rayon dresses from the gallery, and have them listed in the Artfire shop, and will add more items over time. This way I have two outlets to offer my work, one local and one available to shoppers all over the U.S. That should keep me busy! Be sure to check out the shop, and tell your friends!